예송이비인후과 음성센터 김형태 원장의 음성여성화수술의 새로운 방법에 대한 12년간의 연구결과 논문이 세계적으로 저명한 이비인후과 학술지인 “The Laryngoscope”에 게재되었습니다. 논문은 지난 12년동안 음성여성화수술을 받은 362명의 환자를 대상으로 이루어진 연구이며, 음성여성화수술의 새로운 방법과 함께 음성훈련을 병행할 때 음의 상승이 효과적으로 이루어진다는 결과를 보여주고 있습니다. 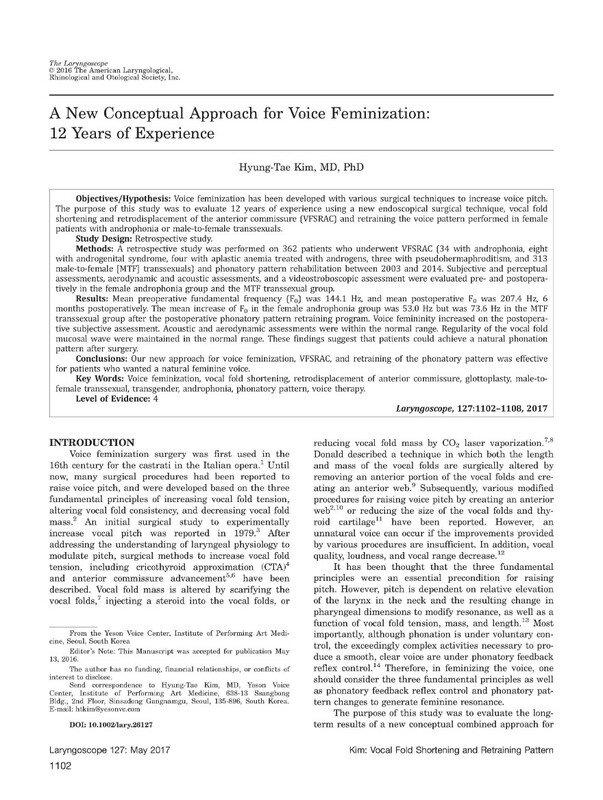 연구논문제목 : A New Conceptual Approach for Voice Feminization: 12 Years of Experience. Voice feminization has been developed with various surgical techniques to increase voice pitch. The purpose of this study was to evaluate 12 years of experience using a new endoscopical surgical technique, vocal fold shortening and retrodisplacement of the anterior commissure (VFSRAC) and retraining the voice pattern performed in female patients with androphonia or male-to-female transsexuals. A retrospective study was performed on 362 patients who underwent VFSRAC (34 with androphonia, eight with androgenital syndrome, four with aplastic anemia treated with androgens, three with pseudohermaphroditism, and 313 male-to-female [MTF] transsexuals) and phonatory pattern rehabilitation between 2003 and 2014. Subjective and perceptual assessments, aerodynamic and acoustic assessments, and a videostroboscopic assessment were evaluated pre- and postoperatively in the female androphonia group and the MTF transsexual group. Mean preoperative fundamental frequency (F0 ) was 144.1 Hz, and mean postoperative F0 was 207.4 Hz, 6 months postoperatively. The mean increase of F0 in the female androphonia group was 53.0 Hz but was 73.6 Hz in the MTF transsexual group after the postoperative phonatory pattern retraining program. Voice femininity increased on the postoperative subjective assessment. Acoustic and aerodynamic assessments were within the normal range. Regularity of the vocal fold mucosal wave were maintained in the normal range. These findings suggest that patients could achieve a natural phonation pattern after surgery. Our new approach for voice feminization, VFSRAC, and retraining of the phonatory pattern was effective for patients who wanted a natural feminine voice.